Sum paid by assessee, being individual on account of preventive health check-up. In case of HUF, the policy can be taken on the health of any member of such HUF. Deduction on account of medical expenditure shall be allowed only when it is incurred on the health of the aforementioned persons who are senior citizens. 'senior citizen' means an individual resident in India who is of the age of sixty years or more at any time during the relevant previous year. 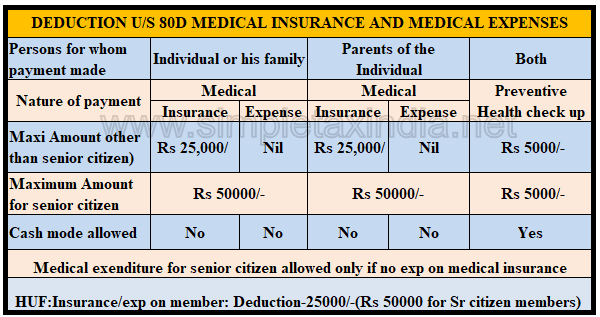 Note: In aforesaid clauses of a, b and c, additional deduction of Rs 25,000 is available when medical insurance is taken on the life of senior citizen. Please note that deduction under this section is available only if actual amount is paid for health insurance and expenses has been incurred as the case may be . Suppose S K Jindal a senior citizen is likely to incur an annual medical expenditure on his treatment of Rs 150000 in FY 2018-19 ,he can claim this 150000 amount under his different Income files as under. He can himself claim Rs 50000 as medical treatment. If he is member of HUF then Rs 50000 can be claimed by their HUF also. All this can be done if all such entities has actually paid the expenses from their account other than cash mode. The same rule is applicable for spouse ,however deduction under this section can be claimed for children only if they are dependant on assessee. Health insurers typically provide some discount if you pay premium for a few years upfront. But earlier, an individual could claim deduction only up to Rs. 25,000. In Budget-2018, in case of single premium health insurance policies having cover of more than one year, deduction will be allowed on a proportionate basis for the number of years for which health insurance cover is provided, subject to the specified limit. For example, your insurer is offering a 10 per cent discount on health insurance premium if you pay Rs. 40,000 for the two-year cover. Under the new change wef fy 2018-19, the individual can claim Rs. 20,000 in both years. Proportionate deduction in different years for premium paid for multiple years will also benefit taxpayers as it will allow them twin benefit of discount and deduction in the same year which could have been lost if the total premium exceeds the prescribed limit. 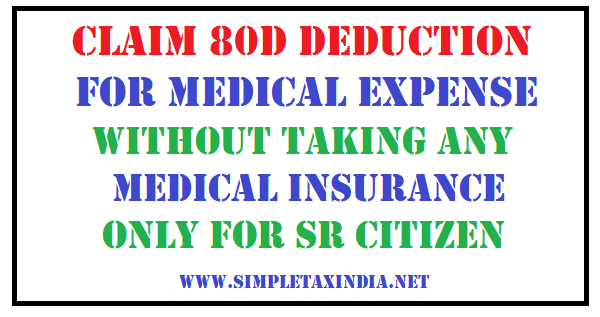 Advice Mr. Rajan regarding the admissible deduction under section 80D for the year 2018-19. 4) Medical insurance premium on policy of his parents of Rs. 36,000 will qualify for deduction (being Senior Citizens). Thus, total deduction under section 80D will amount to Rs. 22,000 on account of expenditure on premium paid in respect of his own health, health of his spouse and dependent daughter and Rs. 36,000 in respect of premium paid on policy of his parents. Deduction on account of expenditure on preventive health check-up will be Rs. 3,000 Total deduction under section 80D will amount to Rs. 61,000 (Rs. 22,000 + Rs. 36,000 + Rs. 3,000). Provided further that the aggregate of the sum specified under clause (a) and clause (c) or the aggregate of the sum specified under clause (b) and clause (d) shall not exceed fifty thousand rupees. Provided further that the aggregate of the sum specified under clause (a) and clause (b) shall not exceed fifty thousand rupees. (4) Where the sum specified in clause (a) or clause (b) of sub-section (2) or clause (a) of sub-section (3) is paid to effect or keep in force an insurance on the health of any person specified therein, and who is a senior citizen, the provisions of this section shall have effect as if for the words "twenty-five thousand rupees", the words "fifty thousand rupees" had been substituted. (ii) "relevant previous year" means the previous year beginning with the previous year in which such amount is paid and the subsequent previous year or years during which the insurance shall have effect or be in force.